Who’s Winning the ‘War on Christmas’? “Happy Hanukah to you” I sweetly replied. A frown crept across her brow. “I’m not Jewish,’ she said. “I’m not Christian,” I responded. I walked away leaving a slightly confused Christian cashier pondering what had just happened. I had no doubt what had occurred. For his part, Mr. O’Reilly has highlighted government policies and political leaders who insist on the separation of church and state in public institutions (mainly schools) and public arenas. They, Mr. O’Reilly insists, are ‘secular progressives’ out to undermine, if not do away with ‘traditional’ America; a nation he and others claim was founded on Christianity. 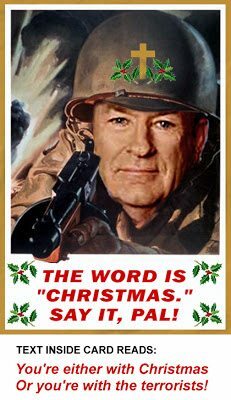 In its recent December 17, 2012 issue, Newsweek declared the War on Christmas over and that Christmas (and Commander–in-Chief Bill O’Reilly) had won. To the amazement of many, a gleeful yet no less determined Mr. O’Reilly continues to lead his counter-attack against the War on Christmas. To understand why he and others continue to do battle requires exploring what the so-called War on Christmas was/is about and what are its larger implications. In short, it is not a war on Christianity or even Christmas per se. It is a struggle against the privileged position of Christianity (and thus Christmas) in a society based on the First Amendment right to freedom of religion and the separation of church and state. In addition, from the Nation’s very founding a majority of North Americans were and are now Christian. Is not, they ask, democracy based on majority rule? From their vantage point, all this was settled long ago, evidenced by the acceptance as ‘normal’ the tradition of Christian-based prayer in school, nativity scenes on public property or publicly funded, Christmas as a Federal holiday, Christian-based symbols (Christmas trees), the use of the Bible as swearing in ceremonies, etc. The so-called War on Christmas challenges the primacy of these traditions. It does so armed with the principle of equal opportunity; the same weapon that challenged and eventually defeated other cherished ‘traditions’ such as slavery, Jim Crow, race/gender/class/religion/sexual preference employment and voting discrimination and on and on. Thus, while Newsweek, in claiming Christmas (Christianity) won the War on Christmas, can cite some small victories such as saying ‘Merry Christmas,’ and calling the symbolic tree a Christmas tree, a larger battle remains engaged on multiple fronts. Bill O’Reilly and others know this, which is why he has purposely broadened his nightly counter-attack on the War on Christmas to a permanent battle against his self-anointed ‘secular progressives’ and their multi-cultural agenda. It is also why the political Right funds and conducts their multiple ‘Wars:’ a War on Women to re-establish the privileges of ‘traditional’ patriarchy, a racist War on Drugs to maintain the ‘tradition’ of institutional racism, a War on the Middle and Working Class (unions in particular) to enhance capitalist class privilege and power; a War on Voting Fraud to maintain the traditional privileges of White political power now facing the reality of shifting voter demographics; and of course a War on Terror aimed at securing and enhancing the privileges of imperial power. Thus, despite Newsweek’s proclamation, the War on Christmas is not over nor will it be for a long time. It is only one small piece of a much larger struggle that engages multiple forces in multiple venues as large as the global stage and as small as the grocery store check out counter. Yes, thanks to Bill O’Reilly and others, my cashier can confidently wish everyone a ‘Merry Christmas’ without fear of retribution or criticism. A small victory for their side I guess, my secular progressive self tells me. Still, her confused look at my Happy Hanukah greeting tells me a progressive chord may have been struck. Indeed, some learning may have even taken place. Next time, I think I will wish the Merry Christmas-maker a Happy Quanza and see where that takes us. Beau Grosscup is a Professor at California State University Chico. Probably the little grocery store clerk doesn’t listen to Bill O’Riely. Probably he was just trying to be nice to you vs being a part of a larger conspiracy. I think it’s OK if he says that and if you wish him a pleasant Hanukah back. We all have something to learn about other peoples faiths. Saying Happy Holiday is kind of….blah, washed out, uneventful, could be anywhere any time anybody? Could be any holiday not yours nor the clerks. I think we are a nation of diversity and I like that and it’s OK to be different and to share one another s experiences and perspectives rather than hiding them under some neutral meaningless language and sentiment. When the kid said that he was sharing with you his experience. To hell with O’Rielly’s ratings campaign. Not necessary if we all just be who we are and not be embarrassed or intimidated or offended by differences. I hope Christmas day was restful and a respite from work or whatever routine and I hope, now that I know you are Jewish that Hanukah was inspirational and heartfelt for you and your family. For my part Jim, you make two mistakes in your analysis. 1. Saying Happy Holidays is not meaningless nor neutral. It is a way to recognize the equality of celebrations around this time of the year and thus the diversity you so much desire. It is a way of not privileging any of those celebrations and recognizing all of them equally. It is the reason the Christian Right fights so hard against corporations and other institutions public and private from setting policy that privileges no one and include all. (These are the same folks who in every other venue vigorously support the private sector’s right to set and enforce policy on employee behavior!). They demand the privileging of Christianity. The so-call War on Christmas doesn’t prevent you from hearing or saying Merry Christmas. It is just alerting us to the community of celebrations ongoing at this time as is embodied in ‘Happy Holidays.’ 2. I am not Jewish.